How did you originally get involved in writing the Woman She Was? 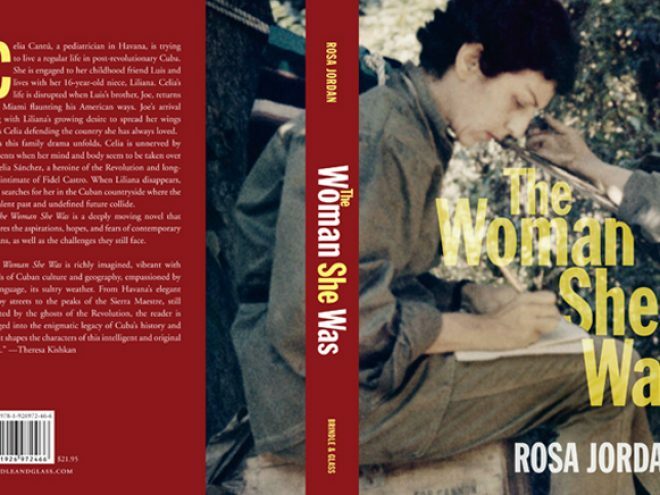 On cycling trips around Cuba I became fascinated with the untold story of Celia Sánchez, whom I believe was the single person most responsible for the success of the Cuban Revolution. I was touched by the admiration Cubans today feel for her and how protective they are of her memory. (She died in 1980.) It is not something they discuss readily with foreigners. I would like to have written a biography about her, but felt that would require my moving to Cuba for a year or more and I couldn’t do that. So I decided on a novel about a modern Cuban doctor who has been strongly influenced by Sánchez—a story entertaining enough for vacation reading, while giving a sense of how Cubans live outside the tourist zone; what their real issues are, and how they cope. How did your perception of Cuba change during the process of writing this book? Not while actually writing the book, but leading up to the decision to write, it took a while to adjust to values in Cuba that are more or less upside down to ones in our country. For example, in most places trying to “get ahead” and better ones economic situation is laudable. In Cuba, working for personal gain is okay, but not all that admirable. Admirable is working for the good of the community. One jockeys to get ahead if one must, but, well, there is a name for it: jinetero—jockey. Someone who is trying to get ahead. In Cuba, this is also the word for hustler or prostitute. I took me a while to figure out that Cubans are not into bargaining. They like to give you something, not expecting (or pretending not to expect) payment. Bit they do expect the receiver to reciprocate appropriately. An analogy would be our inviting someone to dinner. We’d be offended if they offered to pay. But we’d also be offended if, after a decent interval, they didn’t invite us to dinner, or make some other reciprocal gesture. Making sure I got things right from the Cuban perspective. Naturally a dozen fictional characters can’t reflect all the attitudes of all eleven million Cubans, but it mattered a great deal to me that my characters’ thoughts, feelings, and concerns matched those of Cubans I know. An example: First Worlders often suppose that the main problem for Cubans is their government. But ask island Cubans what their main problem is, and the majority will say “transportación.” My characters are ordinary Cubans dealing with their issues, not ours; things like how often the damned train breaks down between Havana and Santiago, or whether their healthy college-bound teenagers are about to be (or have been) seduced by tourists who might hurt them..
What was the most surprising thing you discovered about Cuba during the writing of this book? Not while I was writing but while I was traveling in Cuba, I was constantly surprised by the prevalence of cheerful, non-whiny children. I have spent a lot of time in Third World countries, and have sneered at First Worlders who could see only happiness in the smile of a tiny child selling flowers on the streets of Mexico City; only a photo op in an eight-year-old Mayan girl lugging an eight-month-old baby, and not the misery that pervaded their (probably short) lives. I was not prepared, in Cuba, to find such a huge number of genuinely happy children. Not prepared for a culture where children really are the privileged class. Do you have any future plans to become involved in Cuba related projects? I have a non-fiction book coming out in the fall of 2012, a travel narrative about my experiences in Cuba as I traveled the island over a period of 15 year. It describes many of changes that have taken place in that period (1996-2011. )—and the many things that have not changed.